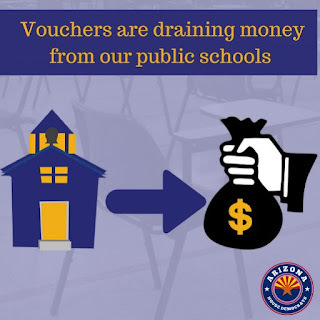 Controversy continues to plague the Republican school voucher scheme, which shifts public dollars away from public schools and toward private schools. Following reports of little oversight of the voucher program and more than $100,000 of misspent public money, a new analysis confirms that vouchers aren't really helping the students they were purportedly designed to help. Too bad there aren't more citizens and politicians who look at the actual children being affected--harmed--by these unfounded claims of vouchers helping anyone except the very wealthy WHO DON'T NEED IT. Getting a strong education in a state that hates teachers and public education is tough enough. Stand strong!